THE BLUE AVIANS AND BLUE SPHERE BEINGS : DO YOU KNOW WHAT LOVE CAN DO? “Well, I always take people back to the story of the caterpillar and the butterfly. The idea is that we’re all living in a pupal phase in our human body, but within us is an ascended phase, a next-level, the butterfly. And the problem is we’re kind of like that cartoon I saw once of the two caterpillars looking at the butterfly, and another one flies by and they say, “You’ll never get me up in one of those things.” Right? We don’t have a concept of what it means to ascend. But simply, it means to become a celestial traveler, a cosmic being – to leave behind our caterpillar phase and morph, or phase, into an ascended form. And as you said, I’ve really studied the art of ascension. And they almost always show it the same way. I love William Henry’s explanation because its simple, elegant and straight to the point. Ascension is misunderstood by many of us because we over complicate it. It’s really simple at the end of the day. I’ve come to believe that Ascension is a state of awareness, nothing really changes, except your awareness of who we are. From a cause and effect standpoint, the awareness of who you are is what causes these changes to occur. So the higher vibration, remembrance of past lives and telepathy and other ideas associated with ascension are the effects from our awareness. When we connect with our True-Self then we go through what is termed as ascension. Our connection with the divine aspect of our self reveals the magic that has always laid within each and every single one of us. We shift from the paradigm of being powerless, to a paradigm of being powerful, because only the powerful can come to believe themselves as being powerless. The fact we believe we’re powerless shows us that we are powerful. I’ve heard many say that upon ascension you form some kind of light body, that you vibrate at a higher frequency, therefore making it easier to experience whatever you desire. It’s been speculated that our body is currently undergoing an transformation from a carbon based body to a crystalline based body. This would effectively give our awareness undeniable proof that we all are multi-dimensional beings of Light. We’re essentially all undergoing a process of birth. We’re transforming from the inside out. Everything that we once believed is crumpling around us and we’re slowly emerging into this new paradigm, this new way of perceiving our reality. Our role in the universe is being understood more intimately by us. We’re discovering our place in this universe. I do believe that these blue spheres and avians that are depicted in various artwork around the world are not only symbolic images of ascension, but also living beings. The artwork seems to possess both the qualities of being symbolic and actual, objective and subjective. As if it was meant to incorporate both elements for the sake of our upliftment. Here’s a video with Terrance Mckenna that really resonates with what we’re all experiencing. While in Boulder taping my new Gaia TV show, “The Awakened Soul: The Lost Science of Ascension,” I sat down with Corey Goode and David Wilcock for three episodes of their hit program “Cosmic Disclosure: Inside the Secret Space Program”. Corey is a “SSP” whistle blower who tells an astounding story of advanced human civilizations in space, and extraterrestrials called Blue Sphere Beings and Blue Avians, who are guiding humanity. Hundreds of thousands of people have flocked to “Cosmic Disclosure” to listen, to lend support to Corey, and to advocate for a reshuffle of the ET-human relations deck… and a new beginning for humanity by disclosing the existence of our true place in the solar system. Critics say Corey’s story is straight out of the fantasy and scifi pulp magazines of the 1920s and 30s. The first question David Wilcock asked me during the interview was if I thought Corey was crazy. I have no idea, I said. People believe what they want to believe. Seeing is believing for some. They want proof: pics, video, something. Others see it and believe Corey, trusting in his sincerity and the vetting of David Wilcock, who is known for his links to ET insiders and whistleblowers. All I know is I enjoyed talking with both of them. When I first heard Corey’s story, I thought, wow, he’s talking about two of my favorite subjects; the Bird Tribe and the blue sphere wormholes or ascension spheres of the ancients. Any minute now I thought he might get into some of the ancient beliefs about these subjects. By the way, neither of these subjects are out of scifi magazines. That is, unless you read the ancient Egyptian religious texts, Hindu literature, Native American spiritual tradition and the Bible as scifi and interpret Christian art portraying the ascension of Jesus on a blue sphere as fantasy art. After seeing my show, and the historical art I presented, the Gaia producers immediately booked the interview with Corey and David. What I was saying corroborates Corey story, they said. The result was an exciting conversation. Well, one interview turned to three. We left A LOT more to discuss. It’s not everyday that one gets to fill in a blank for a dot connector like David Wilcock, but as you’ll see in the show, this is exactly what happened. The pearl I dropped on David’s door, I am certain, is a gift that will open new pathways for him and all who follow his work. All best blessings to all. 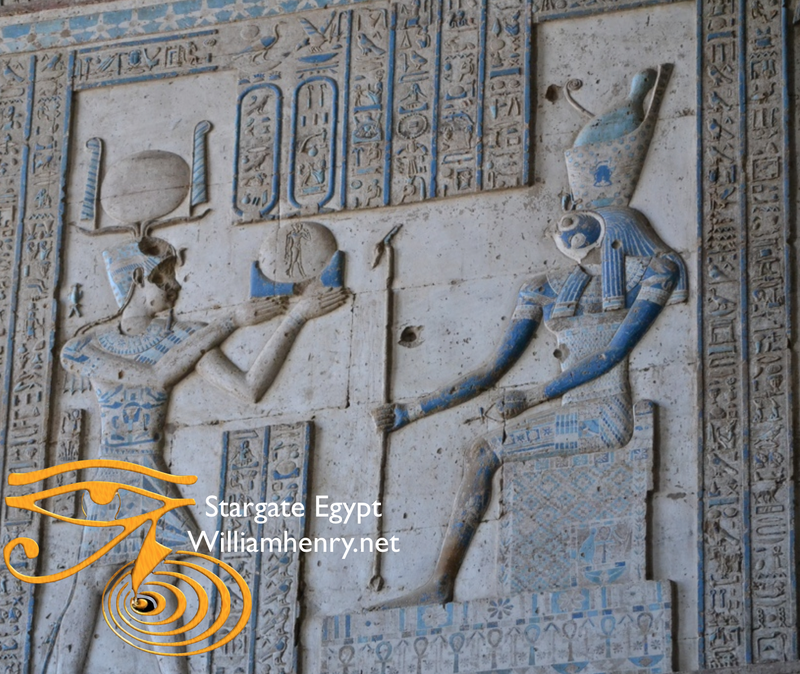 Corey was impressed by my photos from the temple of Horus at Edfu showing Horus, the falcon-headed god, painted blue. He had never seen any of the images I was presenting. His spontaneous reactions were insightful and wonder-inspiring. He reminded me of how I felt when I first took the photos. 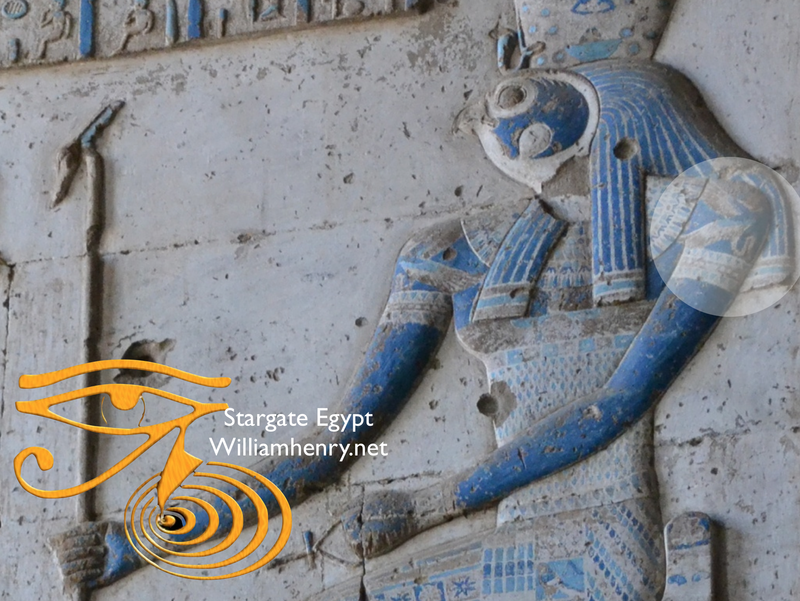 Horus in blue at Edfu. Photo by William Henry. More, he loved my collection of photos of Horus in blue from Denderah. He was especially impressed that, until five years ago when the Egyptians restored the ceiling, the magnificent blue images were covered with black soot. No one knew Horus was blue. Talk about divine timing! We laughed, wondering if they were waiting for Corey’s revelation of the Blue Avians? Horus enthroned at Denderah, Egypt. Photo by William Henry. Where I took Corey and David from there in my ascension art collection blew their minds (pun intended). In this article I will share some key insights from my research on the Blue Sphere Beings and the Blue Birds. Then, I will share some of my thoughts on the Bird Tribe that weren’t part of our conversation. They are actually insights from two extraordinary mystical sources, “The Wizard of Oz” and Paul McCartney. Ever since reading Ken Carey’s “Return of the Bird Tribes” back in 1992, I have been on the trail of an ancient tribe of spiritual beings who continuously manifested to humans for thousands of years, right up to the present, to ‘upgrade’ humanity…to give us, well… wings. The “Bird Tribes” are not birds. They are celestial beings or angels who are master Ascension Teachers. Carey calls them Star People. They really are Star People, but in real life they really do not have wings. Carey’s book inspired me to research the Bird Tribe’s angelic language, the Language of the Birds. I wrote a book about it in 1998, but that is another story for another time. 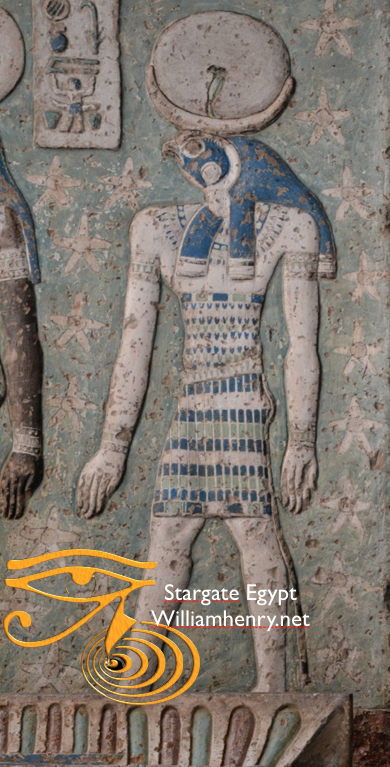 Thoth resurrects King Seti I, dressed in Osiris’s Karast garment, from the dead with the ankh or ‘Key of Life’. Photo by William Henry. …And to the falcon-headed Horus, the son of Isis and Osiris. 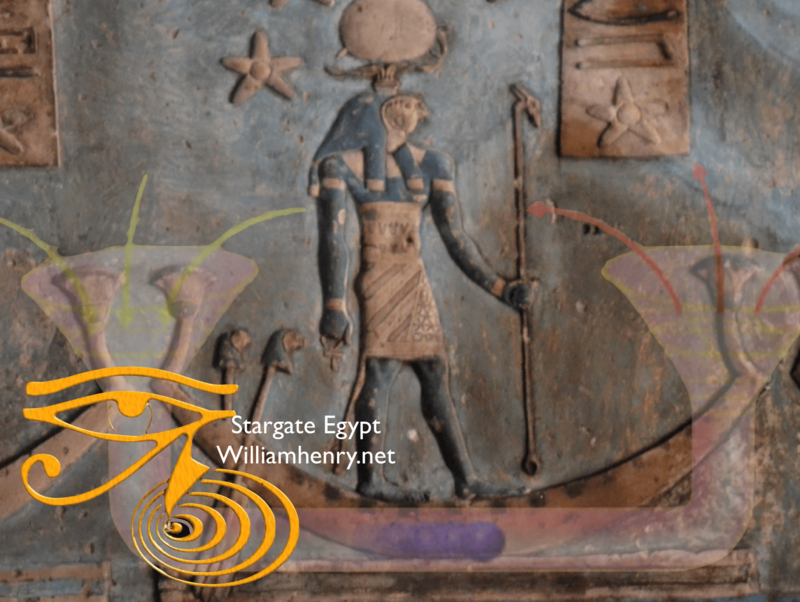 In the ancient Egyptian Pyramid Texts, some of the oldest ascension texts in the world, the deceased king rises into the portals in the sky as Horus, indicating his role in the ‘stargate mysteries’ of ancient Egypt. Horus symbolizes the living, eternal light body returning to the stars…becoming a Starwalker in the Dimension of the Blessed. 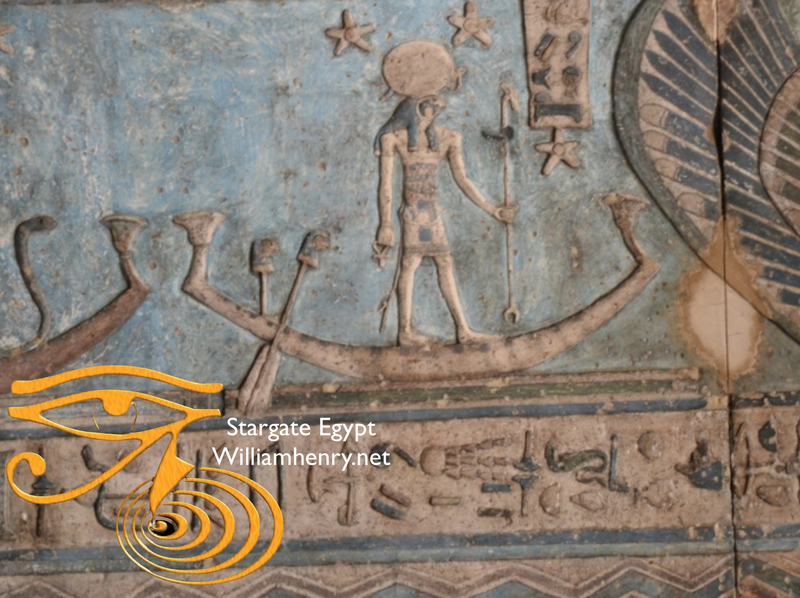 These stargate mysteries came alive for me on the ceiling of Hathor’s magnificent temple of Love and Joy in Denderah, Egypt, where we see various members of the Bird Tribe, including Isis, the Great Cosmic Mother, and Horus, her Son of Light, as blue bird-people along with blue humans wearing feathered cloaks. Horus, the Son of Light. Photo by William Henry. 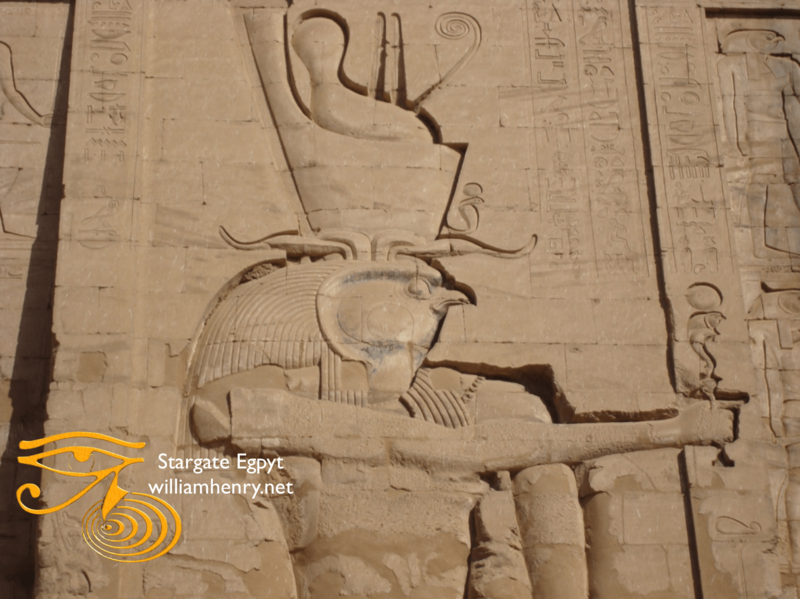 Horus surfs the Ship of Eternity or Ark of the Millions of years. 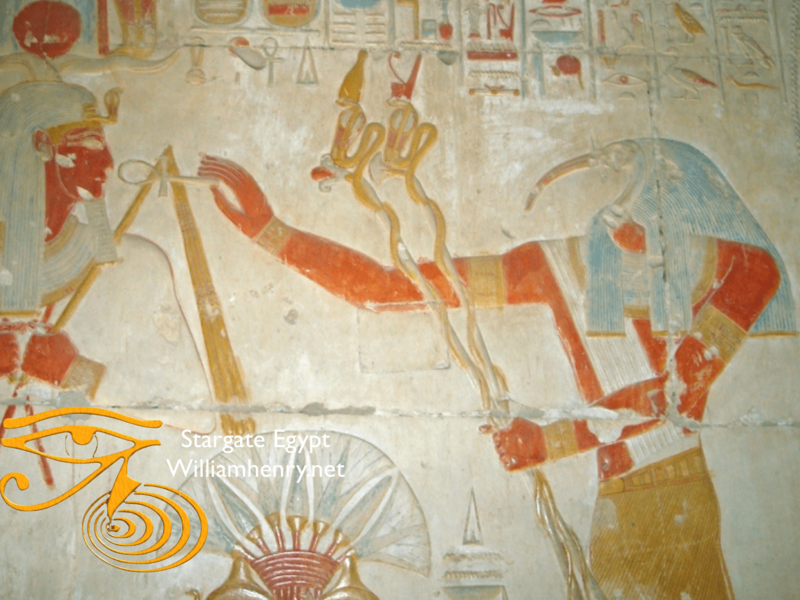 We also see the blue bird man, Horus, surfing the cosmos on his ship of eternity, his wormhole-shaped sun/star/boat. We see Horus on his feathered ascension throne. Horus on his feathered ascension throne. 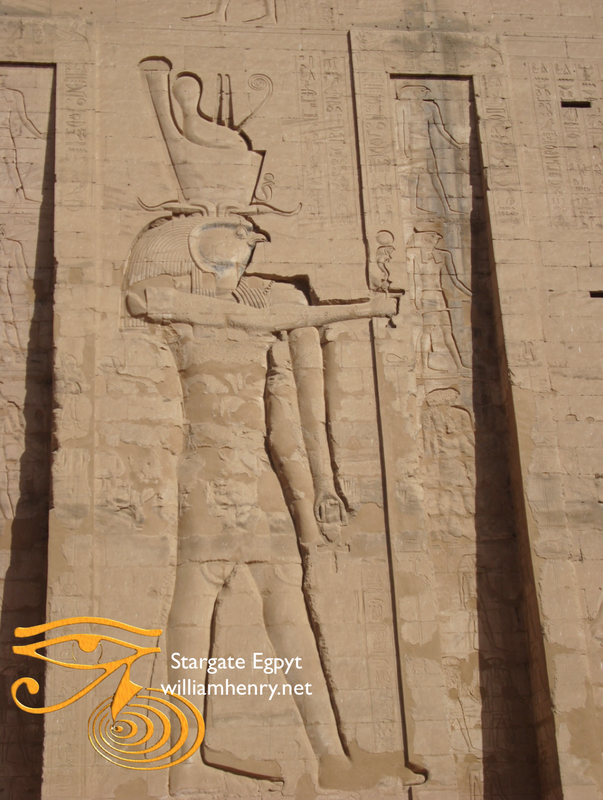 He holds the ankh and the usa scepter that open the gates of the Dimension of the Blessed. Our goal, as humans, is to attain this feathered ascension throne and ride the wormholes of eternity. This means, we are to become a being of light, like Horus, and the rest of the Bird Tribe and enter the promised Dimension of the Blessed. So, there we have it. 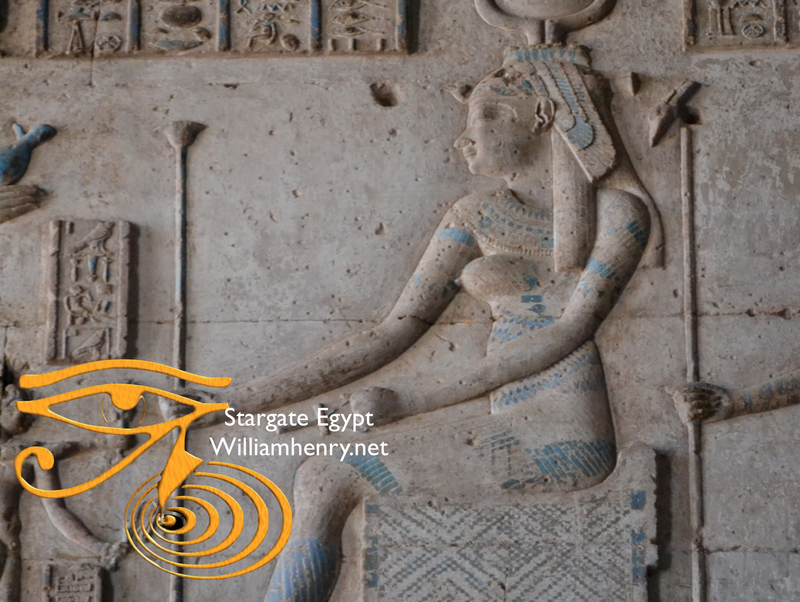 Blue Bird star people, Blue Avians, in ancient Egypt. Incredible! Right? Taking a closer look at Horus’s shoulder patch we see that it the ‘logo’ of the blue birds, the winged serpent. The winged serpent was adopted by Judeo-Christianity as the symbol for the Seraphim, angelic beings of pure light and pure love. 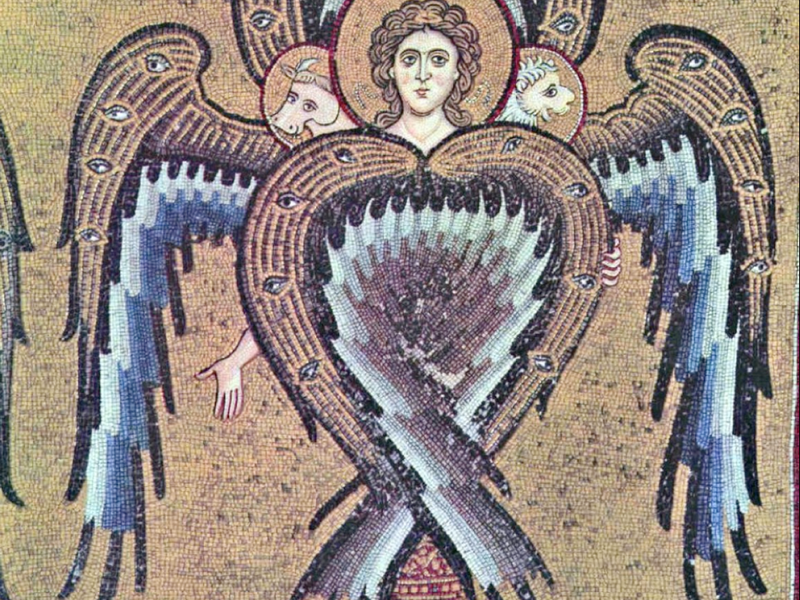 Seraphim are usually portrayed as red winged bird men. Red, because they burn with the love of the Creator. However, they are also shown as blue angels or bird men. Blue like the sky. Blue like true blue. These blue ‘bird-men-angels’ are the watchers of the door or gate linking earth with the heavenly realms. 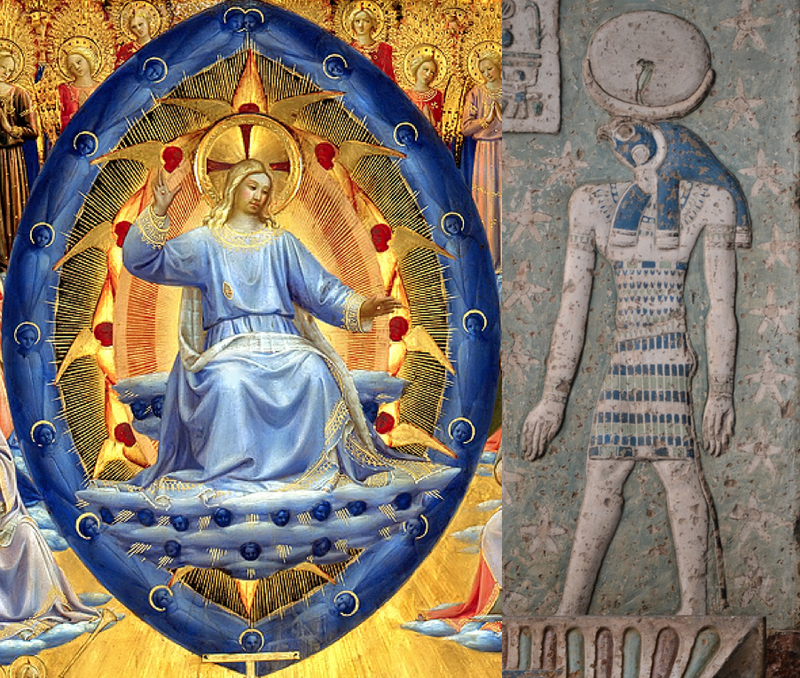 This is why they are shown forming a vesica-shaped gate around the throne of Christ, the new Horus. The Seraphim came to earth to teach humans the art of ascension or transformation into angels or ‘blue birds’. To be kissed by a seraphim meant to be initiated by them in the secrets of ascension and the mysteries of our divine selves. 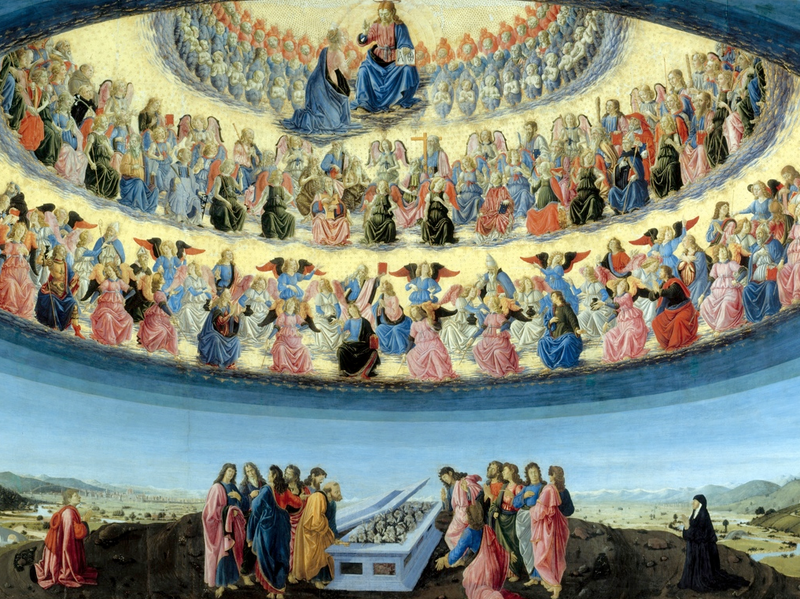 Can you spot the Blue Avians or Blue Seraphim in the painting below? Clue. Look through the eye in the sky. Detail of the Blue Avians or Blue Seraphim at the Throne of Christ. My Bird Tribe research led me to become an ascension researcher and a specialist in exploring the secrets of ascension-themed art. To me, there is nothing more fascinating, or imperative that we understand, than the Ascension of Jesus. 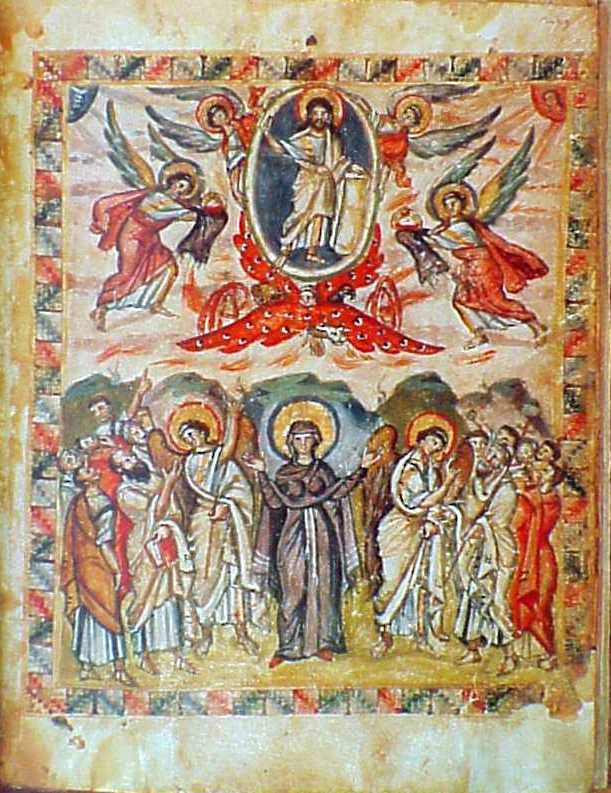 “The Ascension is a fantastic subject in Christian art, as well as a theme in mystical writings. 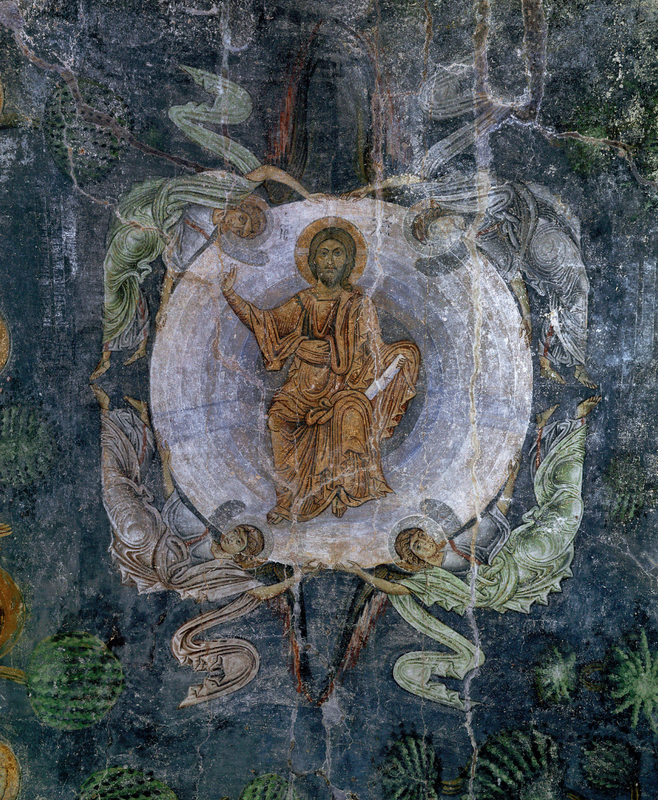 By the 6th century the iconography of the Ascension had been established and by the 9th century Ascension scenes were being depicted on domes of churches. The oculus or eye of the dome is considered the Gateway of the Sun. From this gateway at the top of the dome rises the World Axis, the link between Heaven and earth. 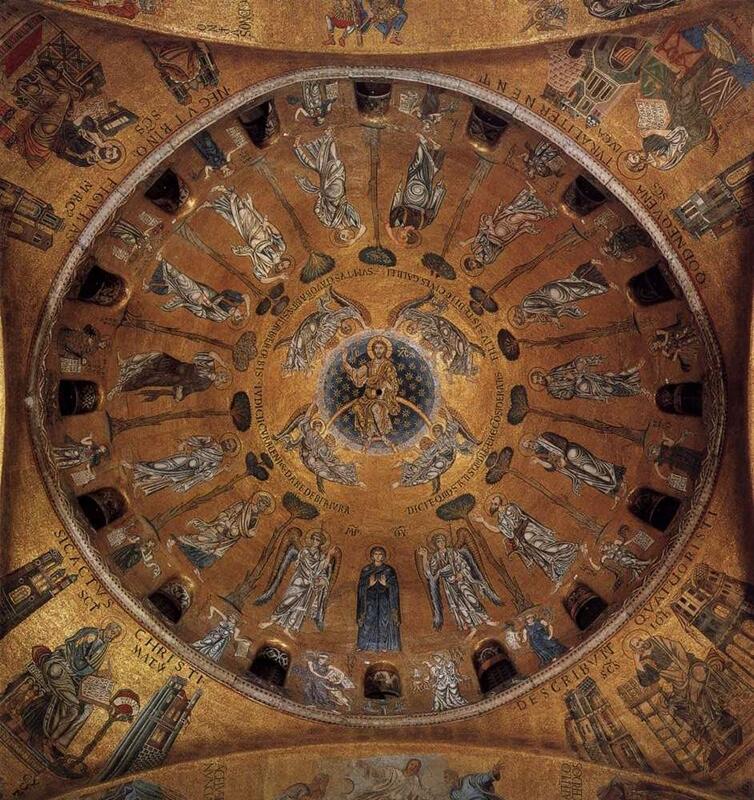 Domes, therefore, are the threshold or gateway of the spiritual world. 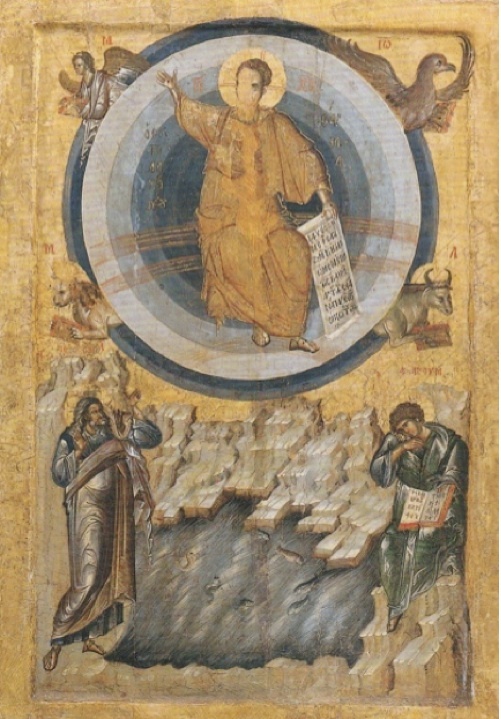 Thus, portraying Jesus ascending in/through a dome symbolizes him traveling through the wormhole. The Rabula Gospel. 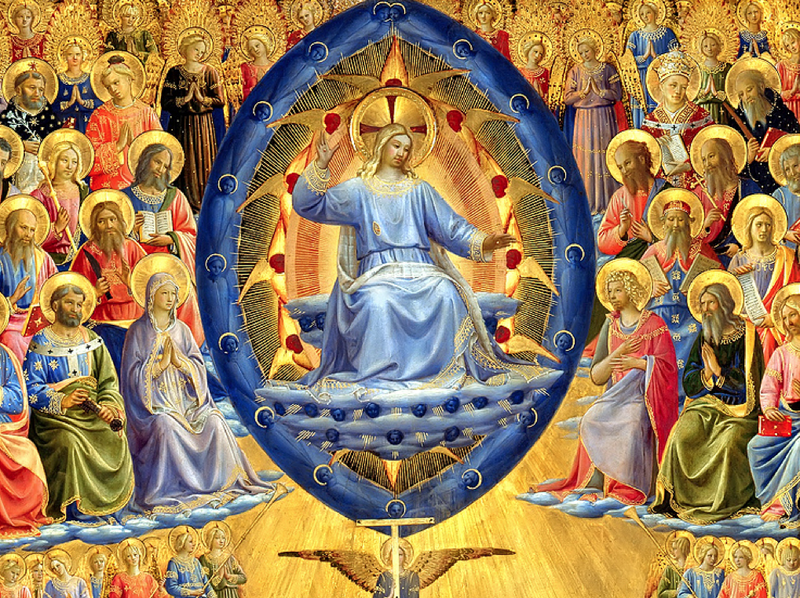 Christ ascends in a blue sphere held aloft by angels. 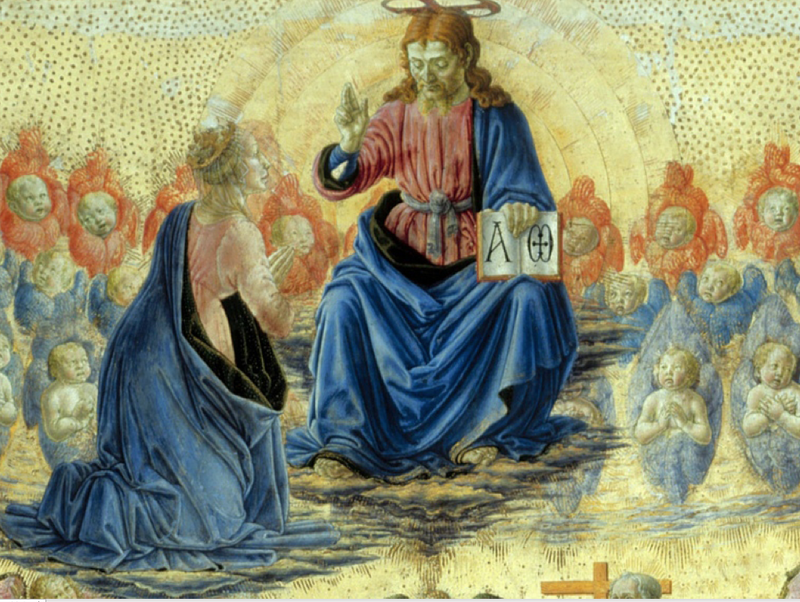 So, this early gospel set the blue tone for all future Christian ascension images. However, I believe the imagery originates with the images of Horus on the wormhole boat at Denderah. While the Egyptian art show a side view of the ascending figure, Christian art show the same concept from the face on. In Egypt, we see a side view of the wormhole. In Christian art we are looking down its throat as Jesus travels through it. That’s my take anyway. I have been collecting images of the ascended Christ in a blue sphere. The meaning is clear. The blue sphere is to be imagined as a portal or gateway. I wondered if this is what Corey meant by the blue sphere beings. The Bible calls the blue sphere a ‘cloud’ (Acts 1:1-11), but it is clearly intended to be understood as a Merkaba vehicle or Throne. It has the characteristics of a wormhole, an interstellar or interdimensional transportation device. As the book of Acts tells us, Jesus will return the same way he left: on the cloud/blue sphere wormhole thing. 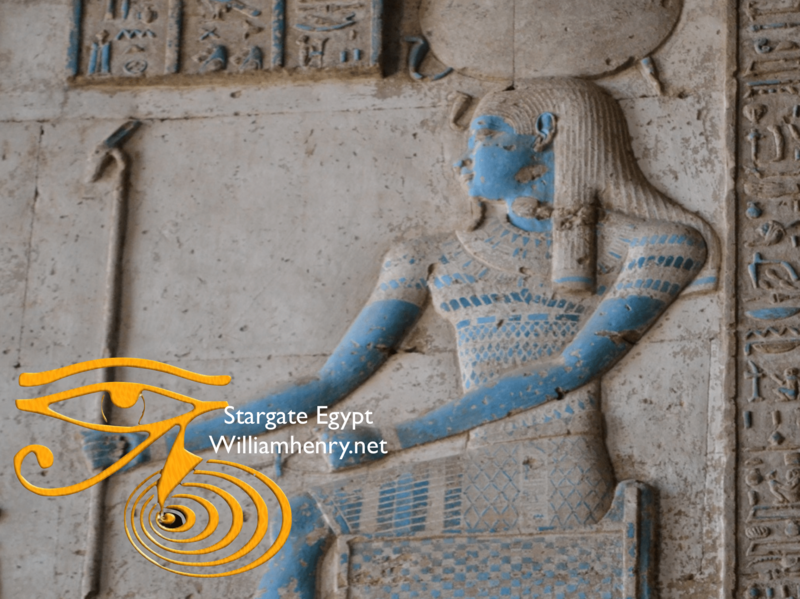 I haven’t experienced the Blue Sphere Beings like Corey has, but I did have a powerful encounter with the blue eye of Horus in 2002 while meditating in the King’s Chamber of the Great Pyramid. From out of nowhere, I saw a blue eye on the screen of my consciousness beaming bliss at me. It was hovering just above me. It was conscious and I knew it was trying to make contact with me. This went on for several minutes. I was awestruck by the experience, even more so when I realized it was the blue Eye of Horus that was beaming a blissful love at me. After this experience, I knew I would spend the rest of my life trying to understand what happened… and how to get it to THAT feeling again. Fortunately, I came upon the work of Swami Muktananda (1908-1982), the founder of the Siddha Yoga spiritual path. While he didn’t discuss the Eye of Horus, he did offer an explanation for my experience based on his teaching about the Blue Pearl. According to Muktananda, the experience of the Blue Pearl, also referred to as the blue dot, is the most significant of meditation experiences. When kundalini energy (the God Force that ascends our inner Tree of Life) becomes active through mantra meditation and rises through the seven chakras many see a subtle blue dot appear and disappear on their mental screen during meditation. The serpent on a pole symbolizes the rising of kundalini. The Israelites called this symbol the Nehushtan in the story of Moses lifting the serpent of healing. When Moses lifted the serpent a winged serpent manifested and healed the Israelites. The scriptures describe this Blue Pearl as the divine light of Consciousness, which dwells within everyone. Buddhists teach that through regular and prolonged meditation and focus on the Blue Pearl — or the blue sphere — one gradually experiences their true nature. More, the Blue Pearl contains, and provides access to, different planes of existence. When the Blue Pearl expands, writes Muktananda in Secret of the Siddhas, an extraordinary Blue Being some call a Blue Angel manifests from the center of its center…in a blue sphere. As I discussed in Starwalkers and the Dimension of the Blessed, traditional shamanic peoples around the world describe a Blue Pearl, an exquisite, enchanting blue light that is a mode of transport. It appears in a flash, without any provocation or thought, and opens like a lotus or a wormhole. The Man in Sapphire Blue” by Hildegaard of Bingen. 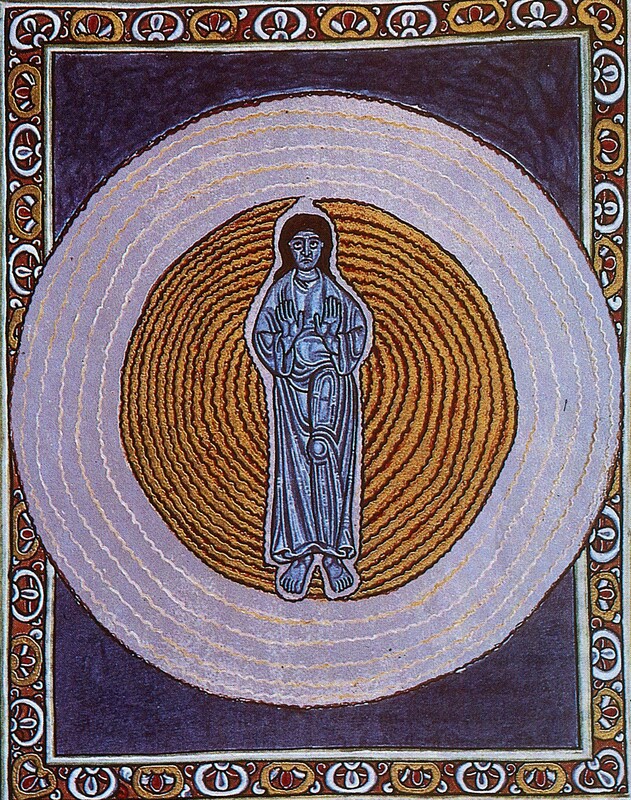 Jesus, the Blue Being, manifested to Hildegaard in a vision. This being is called the Blue Lord. A visualization of the Blue Being is considered to be the realization of the form of God. 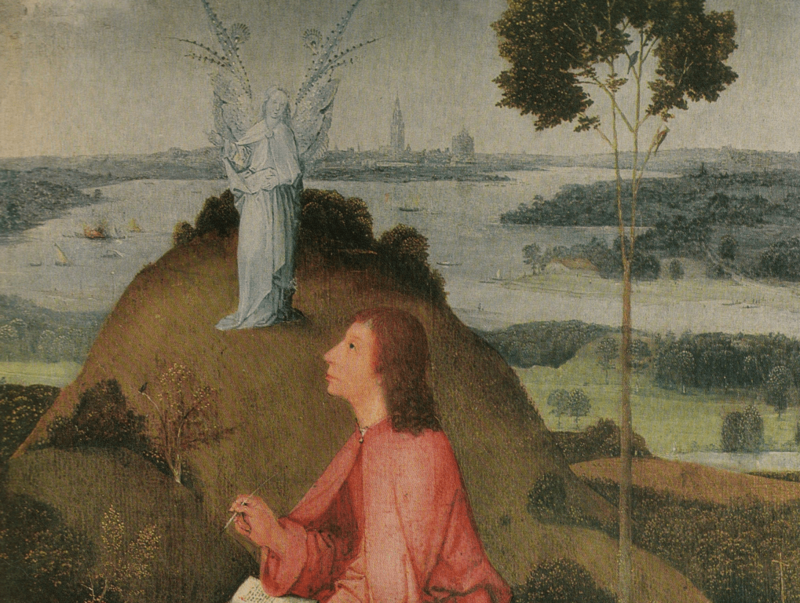 In Hieronymous Bosch’s painting Christ appears as a blue Seraph to John the Revelator. The Blue Being, the embodiment of God Consciousness, is made of an extraordinary light, says Muktananda. Just as Consciousness expands (or pulsates), pervades the entire universe, and once again contracts, similarly the Blue Being, Consciousness, the Great Light once again becomes the Blue Pearl, as tiny as a sesame or mustard seed, and re-enters the body through the eyes. The visualization of the Blue Being leads to complete knowledge. Can you imagine a seed essence within yourself, a Divine Blue Particle — also called a Blue Apple, a Blue Stone or a Blue Pearl — that blossoms into a new (blue) skin or garment and opens gateways in space that allow instant access to other star systems or even to galaxies billions of miles away… paths that take us back to the Source? Strangely (or perhaps not), all this symbolism comes together in “Somewhere Over the Rainbow”, which some believe is the most hauntingly beautiful, and most esoteric, song ever written. It certainly captures the core of our desire: to return home or to make our present home more like our ‘real’ home. Why then, oh, why can’t I? The message of the song is you CAN fly with the blue birds. You CAN attain the Rainbow Light Body. Dreams DO come. By meditating on the Blue Pearl and getting to know the secrets of the Bird Tribes. I can’t think of a better way to describe the mission of the Blue Bird tribe of ancient myth and sacred tradition. As McCartney intuited, the Blue Birds of the past, including Horus, were messengers of love who came through the secret to door and brought the secret of love’s power to transform the human spirit. Yes, we can fly over the rainbow like the blue birds. We can know what love can do. To be touched by the loving kiss of a blue Seraph is the ultimate human experience. Did the USSR destroy a secret US Moon Base in 1977?